First up, make a pair of shims for the inboard ribs. 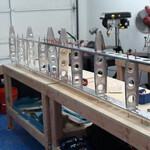 The inboard ribs connect between the spars at an angle - the shims make up the difference in length compared to the rest of the ribs that are straight between the spars. 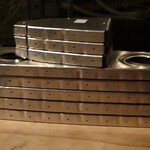 The shims are fabricated from a long piece of flat aluminum. 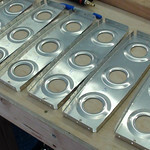 Cut to length & width with aviation snips, then grind down to final size and finish the edges. 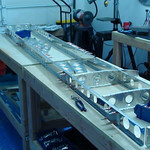 After doing some more research and finding a more efficient fluting method, I returned to the fluting efforts for the horizontal stabilizer ribs. While most were pretty close already, they did need a little adjustment to get them nice and flat. I started this session by partially assembling the skeleton of the horizontal stabilizer to get an idea of how much fluting work the ribs were going to need for them to fit properly. 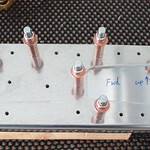 Since the holes on the forward section of the main ribs were not lining up with the spar properly, it was pretty obvious that there was going to be some work required. For today’s efforts, I started by finishing up the horizontal stabilizer attach bracket shaping. While they aren’t perfect, they do look pretty good. I’m planning to take them to the next EAA chapter 12 meeting to have some of the experienced builders look them over and get some feedback before doing the hole layout on them.